Only available for direct bookings. Please just fill in the form on the Rates and Booking page, or phone Jan on 0407 808738. Sea Eagle Cottage has now installed a top quality leather sofa, and two amazing swivel chairs for you to enjoy the views. They really are something special, and create a wonderful ambience for an even more enjoyable stay at this remarkable cottage. Sea Eagle Cottage, has just finished installing a brand new modern kitchen. For those of you have stayed before, and loved Sea Eagle, you will now be pleased that the kitchen has caught up with the quality of the rest of the Beach House. What with the views, and the facilities, we believe Sea Eagle Cottage is the best place to stay at Binalong Bay – confirmed by the fact that Sea Eagle Cottage won the STAYZ AWARD for the PEOPLES CHOICE – BEST PLACE TO STAY IN TASMANIA for 2015. The new kitchen features a state of the art refrigerator – which is quite unusual, and wonderful to use. Soft freeze for your ice-cream, ice maker, large freezer, large crisper compartment, and double French doors for all your regular goodies! There is a top of the range Schweigen Exhaust Fan, glass hobs, modern wall oven, and a built in convection microwave. Large pantry, and drawers throughout the kitchen so it is easy to access everything! Of course we have a really modern electric kettle, with sterilizing and keep warm functions, a four slice toaster, and a coffee machine. We even have USB hubs in the power points. Come – see for yourself! We are thrilled to announce that thanks to all our wonderful guests, SEA EAGLE COTTAGE has just been announced as the 2015 STAYZ PEOPLES CHOICE AWARDS Best Place to Stay in Tasmania. What an honour! And that was before we fitted the new kitchen just this week! The Peoples Choice Award on Stayz is not like the other awards as it is not judged internally by Stayz but instead by votes from past guests. As there are over 1000 properties listed on Stayz in Tasmania alone, it is a wonderful feeling that our guests enjoyed the experience of staying at Sea Eagle Cottage, and taking in the beautiful Bay of Fires, enough to take time out of their busy schedules to vote for us. Thank you so much! Not only did we win Peoples Choice Tasmania 2015, but we were in the top 4 of the STAYZ 2015 INDULGENCE AWARD for Tasmania. 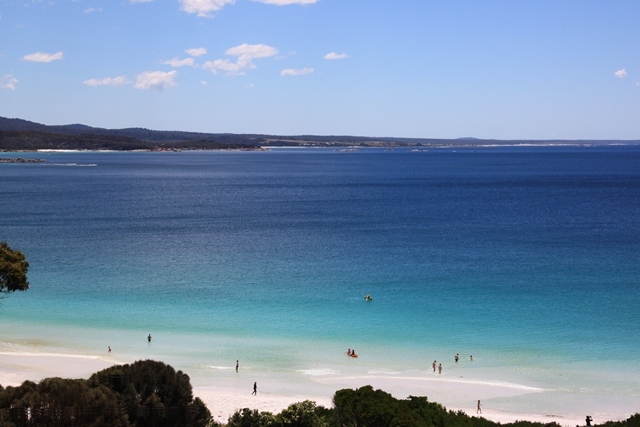 So if you are looking for somewhere super to stay at the Bay of Fires – BOOK NOW! We hope to see you all again soon! Sea Eagle Cottage is simply the best place to stay in Binalong Bay – if it is a great view of the Bay of Fires you are looking for. And now, we have made it even better. We are trying to entice more guests to discover what is really special about the Bay of Fires in Winter. Everyone knows that Tasmania is not the warmest State in Australia, but did you know that the East Coast has the mildest temperature in Tasmania. So it is actually a beautiful time to spend a relaxing few days, in a lovely part of the World. The Bay of Fires in Winter is really quite special. To help our guests be able to experience this for themselves, we are offering a SUPER SPECIAL over winter,of stay 4 NIGHTS GET THE FIFTH NIGHT FREE. This offer expires on 31st August 2014. This means that for $1000 you can get 5 nights in an amazing relaxing atmosphere where you can unwind by simply sitting out on the sheltered deck. Or perhaps if it is a really cool day you can just sit inside and enjoy the amazing views from a cosy centrally heated environment. Of course, you can walk the Bay of Fires if your are more adventurous! The following is our latest review on STAYZ….. and as you can see Millie agrees with us about the views! Spectacular!!! You will be blown away. It’s been a month now since we have opened, and Sea Eagle Cottage is proving to be an extremely popular holiday destination for those visiting the Bay of Fires. We have been so busy looking after our guests – we forgot to update our news page! With cooler weather here in Binalong Bay compared to the stifling heat occurring at many other parts of the mainland this summer, guests are finding it very uplifting to be able to get out on the beach without getting heatstroke. If you are thinking of coming to enjoy the Bay of Fires, I urge you to BOOK NOW as we only have 2 days left in February (the 16th and 17th) at this moment, and March is filling up fast. Next Christmas/New Year is already starting to book out – so don’t miss out – get in early. 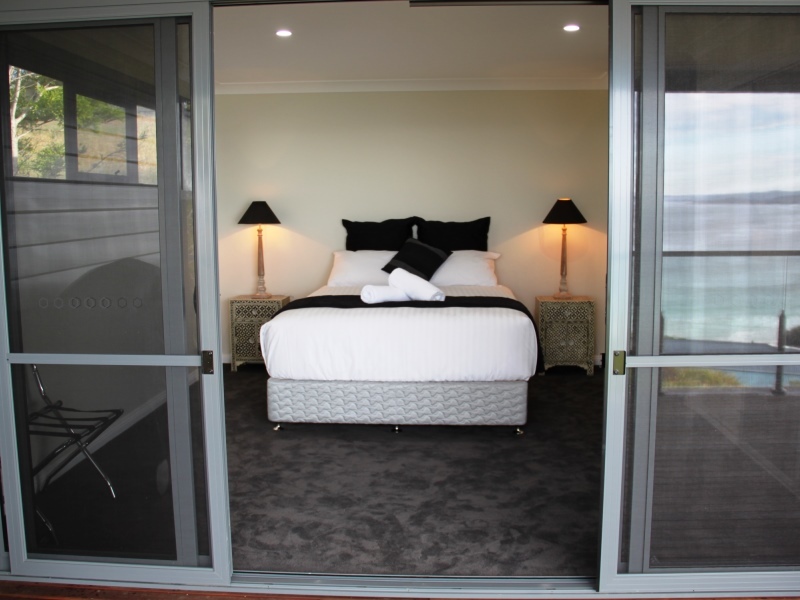 Sea Eagle Cottage is almost ready to take bookings for what will be your most breathtaking holiday views in Tasmania. Now that is a big statement – but just wait and see what we have in store for you when you walk through the door of the newly renovated Sea Eagle Cottage. Enter your email address to subscribe to this website and receive notification of any special deals we may have for you to enjoy.